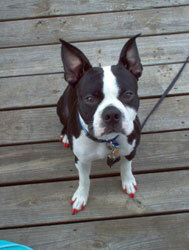 I have a Boston Terrier with severe allergies. They cause him to scratch until he makes himself bleed. The Soft Paws work wonders for him! My mom and dad just remodeled their kitchen and were worried about my dog, Capri (3 y/o Weimaraner), coming to visit, as she's had a little trouble in the past with scratching the cabinet where the trash can is kept. Anyways, one of my roommates in college had these for her cat, so I did a quick search and was thrilled to see that you make them for dogs too! They worked like a charm and everybody was able to relax! And, she didn't even notice them . . . which surprised us all! Now, the only problem is that I'm back in Charleston . 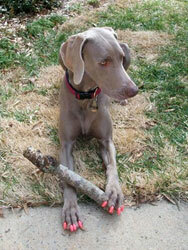 . . and so are Capri's pink nails. Haha - I didn't think that though when I put them on for the weekend. But, my having to explain the situation means more advertising for you guys! So, all in all, the Soft Paws are wonderful. 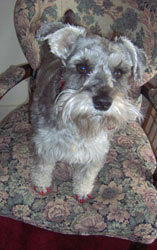 Soft Paws are just wonderful for my Schauzner. I get so many comments about them when she has them on. It is good to have Soft Paws because Sassy loves to jump on us and it really eliminates her from scratching us by mistake. My beagle was scratching bad. I was tired of it. 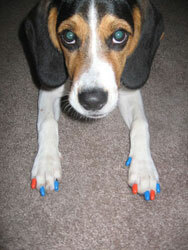 I remember that my aunt had gotten Soft Paws for her cat and so I wanted to see if they had them for dogs. I googled it and bam there they were. I'm a college student at the University of Florida. My puppy is a gator fan so it was only right for him to show his support! Thanks so much. He is adjusted well so far. 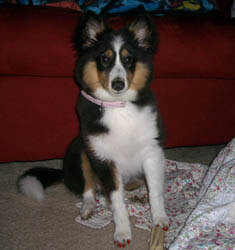 My dog Naobi looks so precious in her Soft Paws!